Leadership Rockland is a partner in two programs that are offered to high school students that are off-shoots of the Leadership Rockland program. Teen Leadership Rockland is a condensed version of the full Leadership Rockland program. This program is a joint venture of Leadership Rockland and Cornell Cooperative Extension. Cornell Cooperative administers the program through its 4-H Youth Development Program. 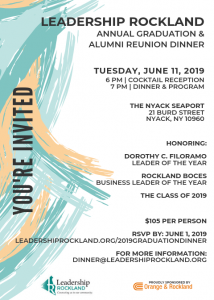 The Leadership Rockland Board of Directors works in conjunction with CCE, and the vast majority of presenters and coordinators for the individual program days come from the Leadership Rockland program. Click here to download the 2018-19 brochure. You can also check for information as well as apply for the program at http://rocklandcce.org/youth/teen-leadership-rockland or click the apply now button. Public Speaking Academy is open to all junior and senior level high school students. These workshops are designed to help you improve your presentation skills and feel comfortable speaking in front of other people. Download the brochure by clicking the Apply Now button.